Another small cool front is passing through and the Deep Sea fishing in Ft. Lauderdale remains good, with again as last week various species of game fish available. Closer to shore and fishing along the reef lines continues to produce some good catches, while wandering off the edge can be a crap shoot more often than not. Our best catches are at and just over a mile off the beach. Water has been clean with south current, which isn’t our first choice of currents, but the fish have been cooperating well. 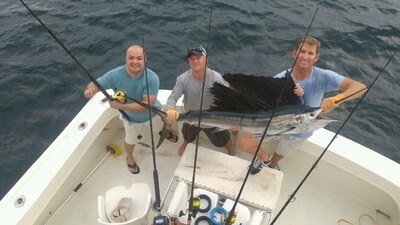 Sailfish once again showing inside of 200 feet with regularity. Those Sails in the photos fell for live Ballyhoo on 20# spin. Wahoo on the troll again inside and in 200 feet of water for most. Good numbers of Kings from 60 to 120 feet mostly caught on the troll. With this front now upon us we will see a slight increase in the sea conditions in these near shore areas. But nothing drastic thankfully in the forecast, especially near shore along those reefs. A trip further offshore and out to the Swordfish grounds, while fishable, will be a little sporty with this north wind, and the few Mahi-Mahi that we are seeing continue to be inside with the Sails, Kings and Wahoo. We are welcoming the cooler days and it is a pleasant change now as winter approaches. Checked the zipper on my favorite winter fishing jacket today just to make sure it’s working properly and the salt and mother nature didn’t take a toll as it sat in the crew’s clothes locker since last February. Good as new and ready to go as we all are. Here’s to a strong Sailfish season as they have already been here in good numbers ahead of their traditional arrival times. Though the Kings have mostly been schoolies we are happy to have the action, and everybody loves a good Wahoo.